Creating a truly sustainable future for the United States means not only identifying the interconnected natural landscapes that remain but also actively preserving them. This irreplaceable green infrastructure promotes healthier living by ensuring clean water and air and providing access to the natural world while enhancing economic growth across communities. To this end, Esri has launched the Green Infrastructure Initiative to help plan a better future for the United States using GIS. There is a pressing need to ensure that the nation’s valuable landscapes are not sacrificed as a result of haphazard or poorly conceived development. Unlike the gray infrastructure of bridges, roads, and dams, this green infrastructure is precious and cannot be rebuilt once it is lost. This also means addressing green infrastructure proactively at the beginning of the planning process, rather than reactively at the end. A green infrastructure approach to development identifies critical landscapes of ecological, scenic, and cultural value and preserves them. Ecologically valuable landscapes contain features—such as watersheds, surface water, wildlife habitats, and coastal areas—that benefit all living organisms in an area, not just people. Scenic and culturally valuable landscapes are characterized by recreational areas, viewsheds, and similar features that increase property values and promote tourism. The objective of the Green Infrastructure Initiative is to create a systematic, information-based method for transforming communities in the United States into sustainable centers by identifying and preserving an interconnected system of landscapes at regional, local, and urban scales. Maintaining the connectivity of open spaces, habitats, and parks is important at each of these scales because connectivity lends the components of these landscapes the resilience they need to survive challenges, such as climate change, better than isolated areas can. Previously, environmental concerns were set aside in favor of what was perceived as economic necessity based on the belief that these were competing rather than complementary aspects of a truly sustainable future. But green infrastructure makes solid economic contributions. For example, preserving watersheds protects water supplies and safeguards the health of human populations, wildlife, and vegetation that depend on that water. Keeping coastal areas intact mitigates the effects of storm events and limits damage to buildings and other structures. And unmarred scenic views enhance property values. Anyone can assess the current state of green infrastructure in a community by using a simple online tool at esri.com/greeninfrastructure. Currently, the majority of local government entities that regulate the use of the land base in the United States do so in isolation from each other and often without tools to effectively collaborate, assess existing conditions, or model the effects of proposed policy changes. GIS makes planning with accountability and metrics possible by providing the tools needed to integrate, analyze, visualize, collaborate, and communicate this new vision for the nation. Green infrastructure planning is fundamentally a spatial problem. Data about the natural world and built environments—from many sources in a variety of formats and at a range of scales—can be combined and modeled to uncover patterns and perceive relationships. To enable people to use GIS for protecting green infrastructure, Esri compiled the first national Green Infrastructure map depicting every intact natural area larger than 100 acres in the United States—regardless of ownership or preservation status. This map shows areas of ecological, cultural, and scenic importance. Local and regional data can be combined with the National Map to evaluate the current state of an area and its probable future, given specific planning policies to determine what actions are required to preserve these valuable landscapes. The suite of green infrastructure planning tools is available across the ArcGIS platform as online tools and desktop toolsets for use with the data behind the Green Infrastructure map. A simple online tool that lets anyone assess the current state of green infrastructure in their area is available on the Current tab. 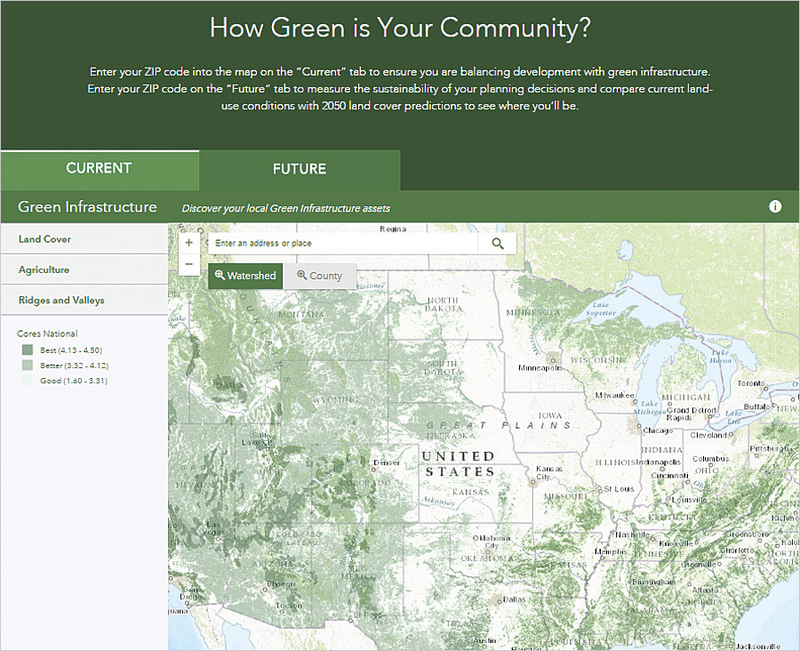 At the same site, on the Future tab, users can filter and weight the national green infrastructure data to model scenarios and generate layers that reflect community values. These layers can be viewed or used with GeoPlanner for ArcGIS, a web application for planning professionals. A premium app offered in ArcGIS Marketplace, GeoPlanner for ArcGIS is integrated with ArcGIS Online and runs in desktop and tablet web browser environments. It contains tools that support every step in a geoenabled planning and design workflow. 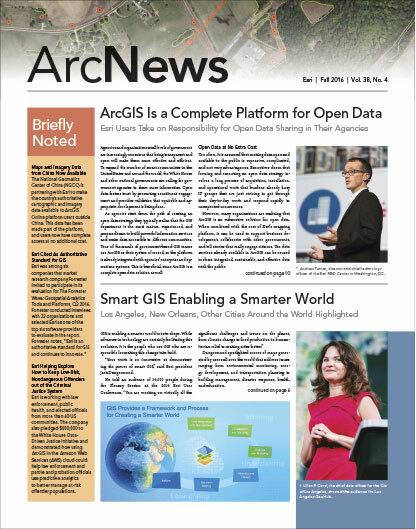 Esri also provides toolsets for ArcGIS for Desktop and ArcGIS Pro that are available at no charge via ArcGIS Online. Using these tools, planners, elected officials, researchers, businesses, and the public can find out the status of green infrastructure in a community now and extrapolate the effects of current planning on the landscape. To take the first step toward a more sustainable future, find out your community’s green infrastructure score. Visit esri.com/greeninfrastructure, enter your location, and see how your region is doing.